Gain competitive intelligence about the market leaders and track key trends affecting the luxury industry. Follow the changes of this rapidly evolving segment in order to inform your marketing, brand and strategy functions. To address the growing need for information on the impact of smartwatches on the luxury watch industry, Digital Luxury Group releases a Smartwatch Feature. What are the estimated sales of smartwatches in 2015 and 2016? What are the top countries searching most for smartwatches? Around the world, where are consumers showing most online interest to purchase the Apple Watch? Which luxury watch brands are getting most interest for smartwatch products? What does the current landscape of luxury-smartwatches look like? Traditional luxury watch makers have started to offer alternatives to meet luxury consumers’ growing interest for connected watches. Some brands have been enhancing their watches for a few years. This is the case of Tissot. The T Touch Expert Solar is connected to over 80 cabins in Switzerland and features temperature and hydrometry among other things. However, the watch does not connect to an application, which might limit Tissot in the amount of additional features. One of the major concerns for luxury brands entering the smartwatch terrain has been the quick obsolescence of the hardware, where a luxury item is timeless in nature. In order to bypass this problem, Montblanc suggests to simply attach a connected strap to their traditional models. The E-Strap released in January 2015, offers an activity tracker, smart notifications and remote controls among other benefits. Ricardo Guadalupe, CEO of Hublot would envisage the idea of a connected strap for his brands. At Baselworld, CEO Jean-Claude Biver also announced TAG Heuer would be offering a connected watch. TAG Heuer has partnered with with Google and Intel for a model that will be released towards the end of 2015. Breitling’s CEO Jean-Paul Girardin also introduced the B55 concept watch. An electronic multi-function chronograph with analog and digital displays and a host of aeronautical time functions connected to a smartphone app. CEO of Frédérique Constant, Peter Stas, presented the Horological Smartwatch. Frédérique Constant’s watch connects to an application for enhanced metrics such as tracking sleep patterns, walking and running activity; while keeping a classic design. Jean-Christophe Babin, CEO of Bulgari, unveiled the Diagono Magnesium. The self-winding mechanical watch incorporates an electronic passport connected to the watch. It acts as a unique key for users to access their house, car or bank account for example. 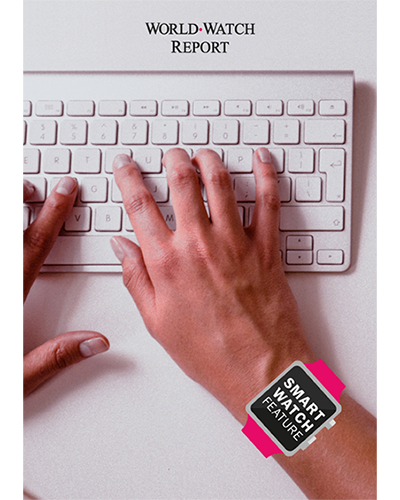 More insights on smartwatches are featured in the latest edition of the WorldWatchReport. And get your own copy of the Smartwatch Feature by email.